Asymmetrical, European influenced aesthetic provides great access to upscale spaces and modernist design as well as excellent suitability for mid-market opportunities in new build, renovation, commercial and hospitality. StileLine® is the ideal choice for Multi-family projects where developers are looking for a way to differentiate without adding significantly to cost. StileLine® meets that need. Sketch Face Veneer that meets WDMA custom grade standards – “A” book/running. Horizontal grain with a 6″ Wide Vertical stile. Door slabs are CARB* compliant. 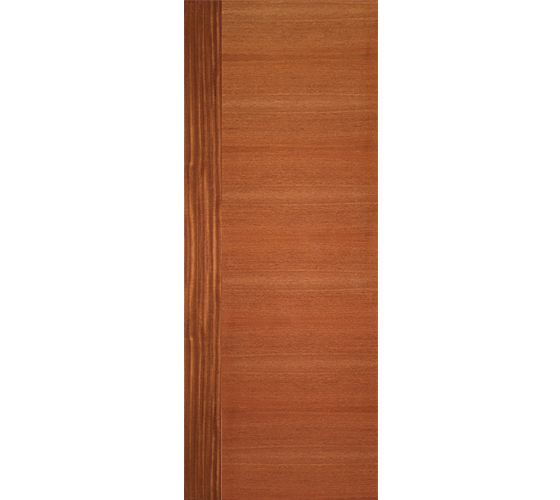 Laminated Matching Hardwood Edge allows for up to 1/4″ additional trim after manufacturing. Single or double door swing arrangements. Face Routing and Grooving Available – – please contact your Lynden Door representative for more information. Standard 1 3/8”, optional 1 ¾” thick. Hollow, solid or fire door options. **Important Note: African mahogany wood has long been celebrated for the beauty of its variety. This species produces a range of bold colors including pinks, reds and browns. The color of the wood is typically lighter when the log is first cut and deepens with maturity. Grain patterns range from straight to wavy. This veneer yields a high percentage of ribbon grain; however this may not be present in all veneers. All woods are a natural material with varying colors and grain patterns, even in veneers taken from the same tree. The appearance of the finished doors will vary due to these characteristics.